During last year we rolled out a new feature where we extracted the offered salary among with the skills in demand. Having scanned more than 50,000 advertisements worldwide, from the most visited job websites in each of the 14 countries our search tools operate daily, we have gained some useful information to share – which of course is available through the Job Trends search tool. In the chart below, you can see that although Java still remains the most in demand programming language for 2014, Python appears to be significantly better paid across the job advertisements scanned (at least according to what each company offers at it’s job description). What could be the reason? One could say that the rules of demand/offer apply, as the number of software developers with Java knowledge is definitely higher than those with deep and solid knowledge of Python. 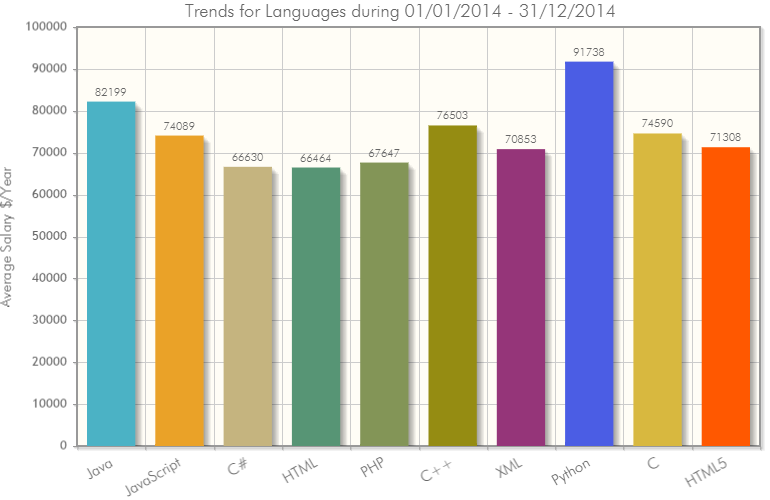 So, although Python is not so much in demand as is Java, it seems to pay better. However, we have to point out that the number of job advertisements that actually mention the offered salary is dramatically low compared to the total number of the scanned advertisements. So although it does not offer the most accurate measurement, we believe that it has to be close to reality. What do you think? This entry was posted in IT Trends and tagged best paid programming languages, skills salary, trends 2014 on January 4, 2015 by Trendy Skills.